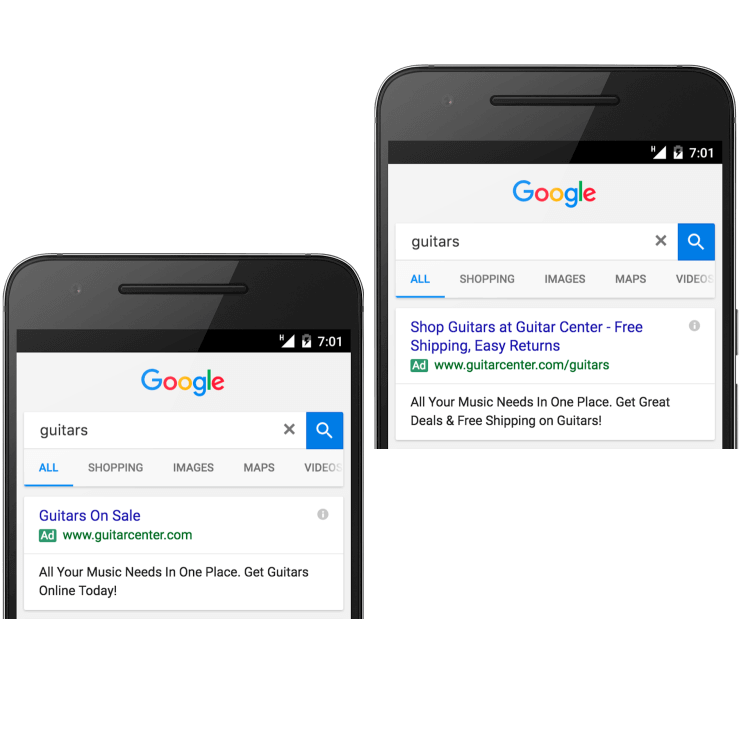 Originally set for October 26th 2016, Google extended the deadline for upgrading all ads to the new expanded ad format to January 31st 2017. That is obviously just around the corner. Are you ready? This new ad format was launched with mobile users in mind. It allows advertisers to create longer text ads with two headlines of up to 30 characters each and a single 80-character description line. There are many studies with varying results showing the click through rate (CTR) uplifts from the new ads. The general consensus is that expanded ads will cause an 8% uplift in CTR at the bottom of the page ad positions on mobile devices. Some studies have shown as much as a 20% increase in CTR. So more clicks at lesser cost per click (CPC) ! Winner! Can I just go with what I have? No! Do not leave your existing standard text ads running or even just add a second headline to an existing ad. Consider the ad content as a whole and look for ways to add more search relevance. Advertisers are using this as an opportunity to improve ads, so don’t get left behind. After January 31, existing standard text ads will continue to run with expanded text ads, but advertisers will not be able to edit or create standard ads, and you can expect your CTR’s to drop as everybody else migrates to the new format. Simple, write new ads. Whether you have 50 or 5000, you must rewrite them all! If you would like us to migrate all your ads, just contact us and we will can put a plan together. Obviously, if you are a Stone Create client, yours have already been done!